Sylvan Remedies is my next puzzle game project. I've managed to simplify the gameplay enough that it's suitable for a text-based Python prototype. To match the simple gameplay, I decided to go with NES restrictions since I haven't tried it before and also because I want to reduce the time I spend on graphics. I probably won't have much time to work on it before I'm done with exams, but I should still be able to post minor updates until then. Here's what I have so far. The herb sprites are items you can collect. It will probably be less crowded in-game, with slightly fewer animals per screen. I decided to make a custom NES palette to have more control of readability, while still keeping the color count low. So far I'm only using two of the tile palettes. I'll figure out how to use the remaining colors when I get around to making village tiles. The monster I added is the sprite rendition of this one. 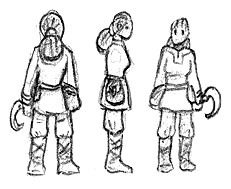 Player character concept. I'm least happy with her sprite, so maybe I can come up with something better later on. The "big" yellow square on the deer's head somewhat looks like a cyclop eye. Is that intentional ? The bag-of-teeth monster looks impressive on the sketch, but the lack of teeth make it look somewhat harmless on screen. I wouldn't have instinctively categorized it as an ennemy. Having a second frame where you see its mouth open could help. Having him displayed on the title screen (like in your cavern-adventure project) could help as well. I didn't see the 'cyclops' eye on the deer's face, I read it as a clear patch that it has on its muzzle, and it's facing at you. And the eyes would be the couple of black pixels on each side of it, I assume. I love the monster, both in the badass pencil sketch and in it's terribly cute NES incarnation. 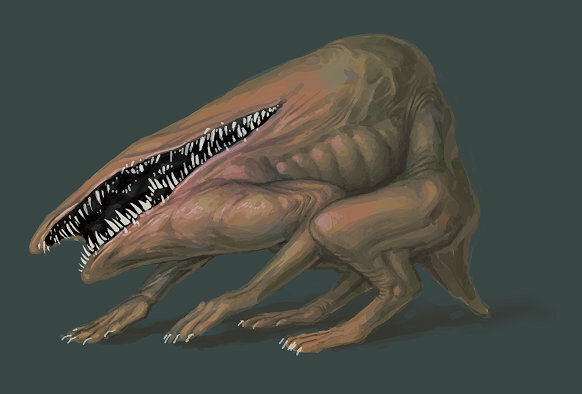 Adding teeth at such a low resolution would probably be problematic (especially since the concept art shows it has very small ones), so maybe just adding another frame of animation where it opens its wide scary monster mouth would be enough for the player to classify it as a threat. I can't get myself to interpret it that way, but I can try to change the shape of the bright spot and see if that helps. Not a bad idea. I could have a relaxed frame for each sprite and an alert frame or something like that. 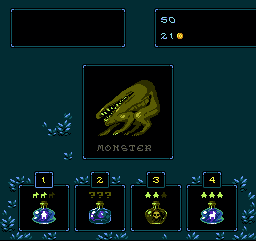 I'll also have larger creature portraits in the game, so you will get to see them up close. I should probably explain a bit more about the gameplay. It looks RPG-like, but it is a puzzle game. Instead of battles, you have animal tests where you test potions to see what they do. I won't be working on the more GUI-heavy screens until I'm closer to finishing my prototype and know what I need, but here's a rough mockup of a "battle screen", just to give you some idea of what it involves. 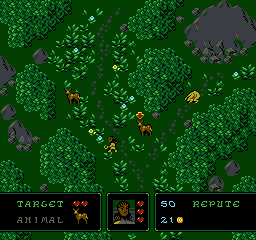 The important elements on this screen will be potions (type, level and target), a target creature (health and level), your current reputation and the resulting change in reputation. The creatures won't attack the player, so player health is not important here. The only thing you have to worry about is reputation. For instance, monsters don't exist naturally. They're created by you. If you leave monsters out in the woods, it's going to have a negative impact on your reputation. I want to at least try to stick to the tile limit, but it's going to be tricky without an easy way to check the amount of tiles without counting color swaps. The large animal portraits will have to be smaller, probably. I'll try to reuse tiles as much as I can, but I'm probably not going to use a hard limit. For NES restrictions you can't have any tiles on the same scanline as the HUD. You should also move it all the way to the bottom of the screen so it doesn't obscure game elements. You won't find any NES games where there are tiles "behind" the HUD. See original LoZ, Crystalis, SMB3, many others.